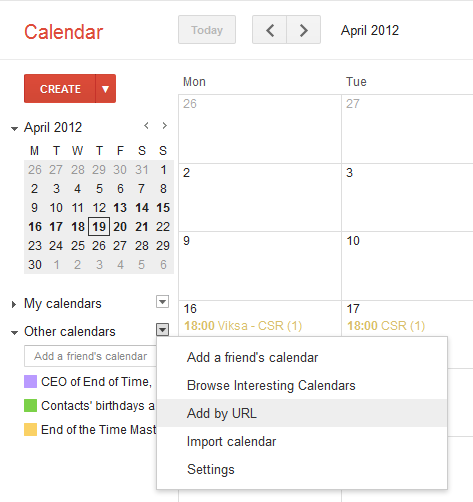 Staff can sync their schedules to their favorite calendar client. Schedule sync uses an open standard called iCalendar to share the work schedule with third-party calendar applications and services e.g. Google, Yahoo, Outlook etc. Calendar applications typically fetch the Humanity schedule on a regular interval. Humanity does not control this frequency. Each calendar client has different options for how often they will re-fetch the calendar (from few minutes to hours) and some Clients, such as Google Calendar, don't have this option at all. When you first set up 'Schedule Sync' with a calendar client, it will fetch your Schedule as it sits currently. 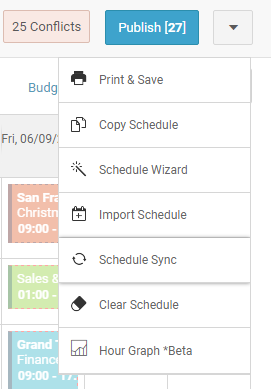 You can easily get their 'Calendar Sync' information by logging to your Humanity account, and the tab ShiftPlanning > click on downward arrow icon beside Publish button > Schedule Sync. Select the option 'Schedule Sync,' which will show sync icon next to each position name on the left side-bar. Copy the 'Schedule Sync URL' that you want and proceed below. Apple iCal - Auto-Refresh Option to Every Hour - Here follow the instructions but use the ShiftPlanning URL instead of the Google one. The easiest way for staff to sync ShiftPlanning's schedule to their iPhone or iPod touch is for them to simply e-mail the URL so that it can be opened on the iPhone or iPod. Once you click on the link from their device, it will automatically ask you if you want to subscribe to the calendar.